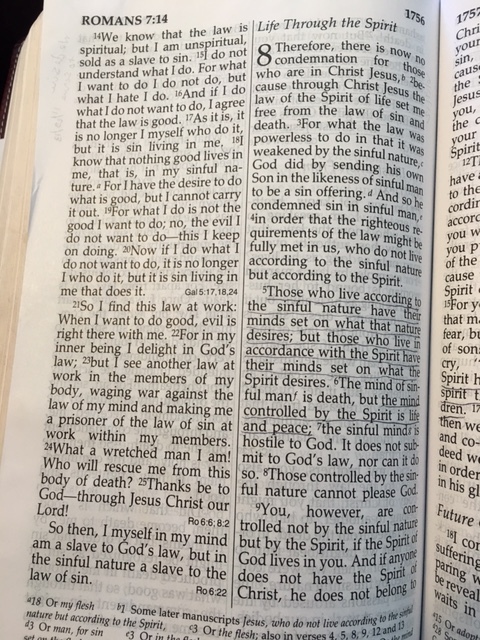 God is doing a great job of helping us memorize Romans 8! If we fill our minds with the garbage so prevalent in our culture, our thoughts will not be pleasing to God. Our thoughts become our attitudes and our attitudes become our actions. So, if we want to change our actions, we have to change what we’re thinking about. We have to fill our minds with God’s truth – every day. This is exactly the reason why God commands us to memorize his word. Because it fills our minds – renewing our thinking, changing our attitude and transforming our actions. We’re on the right path when we’re spending time and effort on memorizing God’s word. It’s a great thing to remember as we struggle through some of these long, complicated verses. God is pleased and he blesses our efforts.